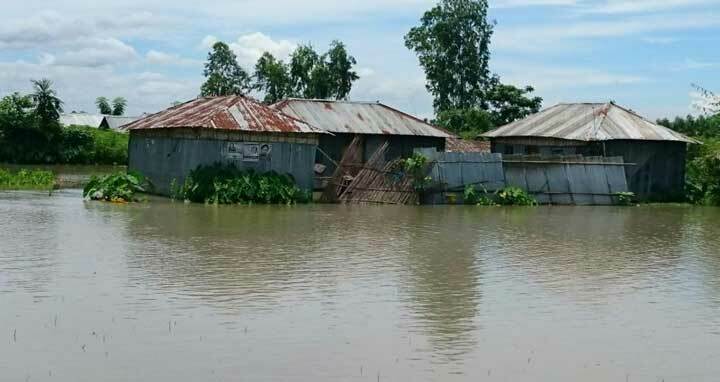 Dhaka, 7 July, Abnews: The overall flood situation in Kurigram in northern Bangladesh remained unchanged on Saturday although the water level in the Dharla River fell slightly. The Dharla River is flowing 2cm above the danger level and the rise of water in the Brahmaputra and Dudhkumar rivers continued. Hundreds of the villages in 30 unions were inundated in flood water which marooned thousands of families. According to a source of Bangladesh Water Development Board, the water level has increased by 12cm in the Brahmaputra and 3cm in the Dudhkumar River in the last 24 hours. District relief and rehabilitation office sources said that around 428 centres have been kept ready for sheltering of the flood victims.